I get the news feed from Brompton on my facebook page and after watching the video and reading Mike’s blog I had some spare time (no work on this afternoon) and thought my previous experience and Brompton tips might be of use. I’m 59 and have used road, mountain and hybrid bikes over the years both as everyday transport and for pleasure. I’d been considering a Brompton as a vague possibility for overseas cycling since they first appeared in the 80s as I consider them to be the finest folding design on the market still yet to be bettered, Lack of space necessitated in me taking the plunge and I changed from my 12 year old Trek hybrid to my P Brompton 2½ years ago when I moved to a third floor flat with no secure ground floor storage and restricted by fire regs disallowing bikes in the entrance area. 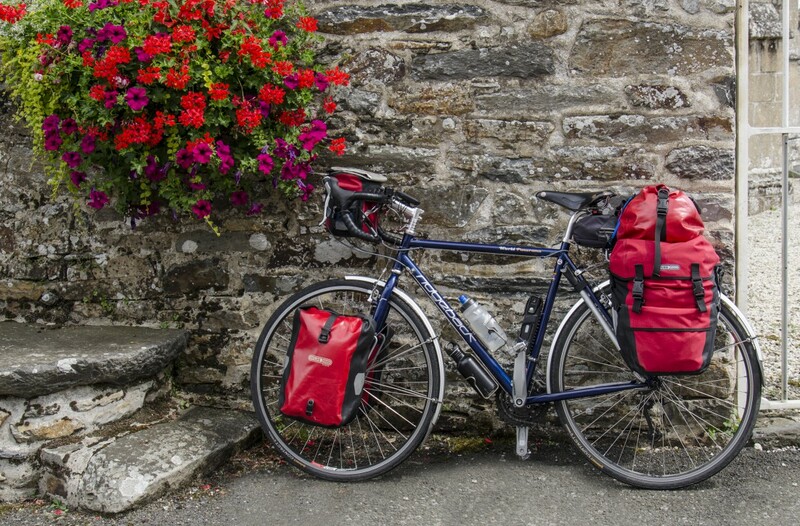 Before that I would do the occasional tour on the hybrid using rear rack panniers and bar bag and I wanted to be able to equip and adapt the Brompton for touring in a similar way if I fancied future trip. I’ve since done the odd longer day rides, so I know it’s fine for covering similar distances, albeit with a slightly smaller gear range, but I’ve yet to ride it for a consecutive days touring. It will happen in the near future when I can grab some time off to travel the 190 miles from Rossendale, Lancashire to Bristol to visit my nephew and his wife soon. I just need to fit pedals that will fit toe clips so I can use the upward stroke as well but I figure a leisurely 5 or 6 hour 40ish miles a day (equivalent 13ish miles walked) should be comfortably achievable in 4 or 5 days ready for the weekend, and possibly bung it on the train at Temple Meads for a change of ride back north afterwards. I haven’t been disappointed in any way and it’s fulfilled my expectations for work (www.blackboardblokeonabike.co.uk), enabling flexible transfer to quicker public transport when needing to get further afield for an appointment, and for downtime pleasure (goes in the boot of a taxi after a few drinks) and I can also recommend the 30L ‘T’ bag/front rack combo which is well made, spacious and waterproof (unless in the unlikely event of being fully immersed in water) as non of my stuff has ever got slightly damp even in the heaviest of downpours and that’s without its belts and braces included flourescent hi vis rain cover which I only put on to help me stand out in traffic at night and in murky low vis conditions. This bag is ideal for larger everyday jobs like supermarket runs and will work well for touring as it’s quick attach/release system allows a seamless transfer to shoulder strap carriage great for heading into a hostel or B&B for an overnight stop carrying your transport. It’s a similarly well thought out design and as well as a large internal capacity, the T bag has an external bottle holder, a compartment to free up trouser pockets and take wallet, keys, phone, camera, on the go snacks as well as extra capacity front and side mesh pockets to take water/windproofs, extra drinks, maps, fruit, gloves etc, Everything a rider needs can be stowed to get to it quickly and easily, close to hand without having to delve deep to find it. For smaller shopping trips and to add extra touring load carrying, I also bought the smaller 16L rear ‘Rack Sack’ (giving me a fully loaded slightly larger capacity to the rucksack I’ve used for lightweight backpacking long distance national trails and coastal paths over the years). It’s not as heavy duty as the T bag but is still well made, has a shoulder strap, gives a lighter option and has a reflective strip. Choosing a rear bag for the Brompton’s lower than usual rear rack needs consideration because if a bag is wider than the front of the rack its proximity will hamper pedalling catching the heel’s of the rider. That’s not to say you can’t do your own thing and if ‘Brompton luggage’ is typed into the search engine, as well as the advertisements for different bag options that appear, there are also links to images of different customisations that people have done and YouTube has some good video ideas often uploaded by overseas users who may not easily be able to get Brompton accessories. One cost virtually nothing good idea utilised an already owned bag with the addition of a a bar or sawn off brush handle tightly nylon cable tied to the saddle’s bag loops so it protruded enough either side to allow a largish backpack’s shoulder straps to be hooked over with the bottom of the sack bungeed or tied to the furthest rear point of the rack in a diagonal maintaining a good space between it and the rider’s heels and a little spare space for a smaller bag (eg puncture repair, spare tube and maintenance toolkit) underneath it on the remaining vacant rack area. Apart from rear rack considerations, the Brompton should have little or no difference from a conventional bike to load up for touring, possibly more stable due to it’s small wheels. It’s advisable to pack the heaviest stuff as low as possible for greater ride stability. This also helps when the bike is parked or has to be raised from being laid flat on the floor eg in the middle of a campsite’s field with nowhere to lean it. The wheels are the pivot points and the nearer the load is to that pivot, the easier it is to lift the bike and manoeuvre it using the handlebar and seat as levers. Great video, love the colour of Chris’! I aspire to a Brompton but have a folding Jango Flik, which I love to pieces. Think folders are the way forward. Hi Tess, hopefully all will be explained in the up n coming blogs! Hope the move went well and you’re getting sorted out in your new abode.